Historian Padraig Lenihan talks about the battle of Aughrim, fought on the 12th of July 1691, the bloodiest battle in Irish history. The Battle of Aughrim was the decisive battle in the Jacobite-Williamite war in Ireland – fought between supporters of the Catholic King James and Protestant King William. In a previous audio feature on the Battle of the Boyne, Padraig explains the context of the conflict. It was at the same time a European war of France of Louis XIV against the Dutch-led Grand Alliance and in Ireland war of Irish Catholic Jacobites and Protestant Williamites. The previous year, the Williamites had beaten the Jacobites back behind the river Shannon, the two Kings had departed but the war in Ireland went on. Here we talk about how Aughrim came to be the decisive blow that ended the war in the Williamites’ favour. We also discuss what it was like to fight at Aughrim in a cloud of blinding smoke with unweildy, unreliable muskets, pikes or cold steel. The infantry, sometimes paid and fed, sometimes not did most of the fighting, but were most likely to fall victim to the the bloodiest phase of the battle – “the execution” when pursuing cavalry rode down broken and fleeing infantry formations. Finally, the bloodbath at Aughrim seared into the Irish memory on both sides of the religious and political divide. We talk about the rich body of Irish language literature mourning the losses at Aughrim and conversely, the triumphal Protestant memory of the battle – marked by bonfires, prayers services and parades. 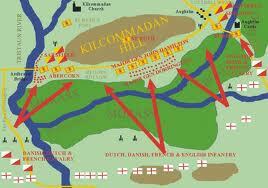 A map of the battle of Aughrim showing the Williamite attacks. While modern Orangemen celebrate the battle of the Boyne on July 12, at the time, due to Britain’s late adoption of the Gregorian calender, it was Aughrim that was fought and celebrated on that day. It was only in the late 18th century that the focus of the newly founded Orange Order shifted to the Boyne, which in the new calendar took place on the Twelfth. Padraig Lenihan is historian of early modern Ireland and author of Confederate Catholics at War 1641-49, Conquest and Resistance: War In Seventeenth Century Ireland, 1690, Battle of the Boyne, and most recently, Consolidating Conquest, Ireland 1603-1727. He teaches in the National University of Ireland, Galway. Written by: John_Dorney on 2 July, 2011.on 8 July, 2018. 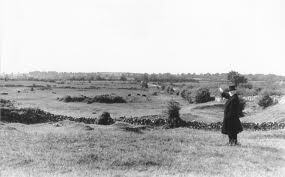 5 Responses to "Padraig Lenihan on the Battle of Aughrim"
The Irish infantry on the left wing were reduced to firing their coat buttons on account of their British cast ammunition did not fit their French muskets. Serious lack of planning and preparation led to piss poor performance. Not the first time that happened. What a balls up! Impossible, that was the 27th Foot in their defence of Carrickfergus in 1760 against the French. Suggested reading The battle of Aughrim 1691 by Mike McNally. Martin Aherne,says,,In spite of all the mistakes,Musket balls Dorrington,and cowardice Luttrell ,Sheldon;if somebody had taken the simple step of placing a score of sharpened stakes ,chevaux de frise ,at the end of the causeway and also scattered a few dozen caltrops ,on it ,making it impassible ,history would be very different today.